I have largely stayed away from opining about the he-said-he-said over what or what not Skype employees were told about the treatment of their stock options. Some employees are alleging they were duped via complicated legalese and double-talk in employment contracts about how their shares would be handled upon termination or voluntary departure from the Internet telephony giant. That matters, since Skype was recently sold to Microsoft for $8.5 billion, well above previous valuations. Thus, those who were, as a Skype PR person said, not in it to win it, um, lost. Dramatic stuff, to be sure. But, even with all the fervor around the employment contract issue, the handwringing about what it means for compensation issues in Silicon Valley and a whole big dose of how private equity companies (in this case, a firm that had bought Skype called Silver Lake) are evil, it’s struck me as little more than an insider read-the-legally-obtuse-contract dispute. And, although I love Reuters’ Felix Salmon’s epic tsk-tsking posts, that’s why I like to see real documents as proof of what people knew and when. 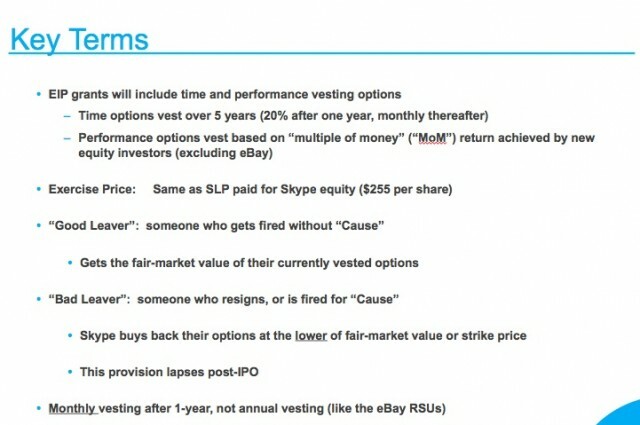 Apparently, a lot and rather clearly from this PowerPoint that was given to employees of Skype as of December 2009 as part of its changing ownership, after Silver Lake and other investors bought it from eBay. While it’s not proof of what employees got it — typically, it is standard HR policy to hand this stuff out to everyone — and who read it (no accounting for slaggards! ), it is pretty clear on what happens upon leaving Skype, either by a firing or quitting.